BEEN THERE (TOO LATE): Before a Braves game at Turner Field in 2001, I walked over to the parking lot where this stadium once stood. This was one of the stadiums built "on speculation," paid for by taxpayers as part of a scheme to lure a baseball franchise from another city. Construction began in 1964 after the Milwaukee Braves owner promised to relocate his team to Atlanta. After construction on it was completed in 1965, the minor league Atlanta Crackers played at Atlanta Stadium (as it was known until 1975) while legal wrangling over the relocation of the Braves continued. This was the fourth circular hybrid stadium used in baseball (opening one month before Busch Stadium II), but it was the first such stadium without any large movable sections. (For baseball fans, that is.) In this simple cost-cutting configuration (which was later used in Oakland Coliseum as well), the football gridiron was laid out transversely, with the goalposts near the left field and right field corners rather than near home plate and center field, as in most other circular stadiums. During football games, about 25 extra rows of seats were installed in the outfield. The 7,000 or so extra seats brought the total capacity for football games up to just over 60,000. All of the seats were arranged in circular fashion, with the result that thousands of fans sat far away from the action, during baseball games as well as football games. The distance down the foul lines was supposedly 325 feet when the stadium first opened in 1966 (I have yet to see any photos showing this, however), and has been 330 feet ever since 1967. As originally built, there was a vast amount of foul territory, artificially reduced by an inner fence that enclosed the bullpens. In 1969, the outfield fence was moved in, reducing the distance to the power alleys by ten feet; the distance to center field was reduced by only two feet. Five years later (in 1974), the previous dimensions were restored. In that same year, six additional rows of box seats and new dugouts were built, substantially reducing the amount of foul territory, which had been about 39,700 square feet. With a neglible slope and ending virtually at ground level, however, those seats were useless for football games. This created a "notch" behind home plate, similar to the one in Oakland Coliseum. In addition, about six rows of seats (some of the movable sections used for football games) were added near the right and left field corners. These changes raised the seating capacity by about 2,000. For some reason, there was a gap of about 20 feet between the fence and the "bleachers." One peculiarity of this stadium was that there was virtually no overhang between the upper and lower decks. Presumably, this saved on construction costs.fOlump An Indian teepee and "Chief Noc-A-Homa" (groan) occupied a part of this vacant space in left field beginning in 1967, and in 1978 the teepee was moved to a higher, more prominent position in the bleachers. Even though the power alleys were rather deep (except for 1969-1972), this stadium had a reputation for being friendly to batters, partly because it was the highest altitude major league baseball stadium (over 1,000 feet) until the Colorado Rockies began playing in Mile High Stadium in 1993. While the rest of the nation was "wallowing" in the Watergate scandal, Hank Aaron made this otherwise-forgetable stadium immortal on April 8, 1974 when he hit his 715th career home run, thereby surpassing Babe Ruth. CINEMA: Several scenes from the motion picture The Slugger's Wife (1985), starring Michael O'Keefe and Rebecca De Mornay, were filmed here. Under the ownership of ultra-ambitious cable television tycoon Ted Turner, the Braves gained the advantages of nationwide publicity and, in consequence, an ample payroll funded by advertising revenues. While Turner was married to Jane Fonda, the team attracted even more glamour and hype -- plus controversy over the "tomahawk chop" which the politically-correct Ms. Fonda grimly followed. The Atlanta Falcons played football in this stadium from 1966 until 1991, after which they moved into the Georgia Dome. Ironically, this was the very moment when the Braves finally left behind their perennial losing ways and began their phenomenal streak of National League divisional championships -- winning the West Division from 1991 to 1993, and after ralignment and the strike in 1994, winning the East Division from 1995 to date. In 1991 the Braves won the National League pennant for the first time since they moved to Atlanta, and did likewise reached the the next year, in 1995, and in 1996. There was only one other stadium whose team went to the World Series in four of the six final years it was in operation: Ebbets Field. In 1995 the Braves finally won the World Series, becoming world champions for the first time since 1957. In 1993, on the day that slugger Fred McGriff was slated to play his first game as a Brave, a fire broke out in the mezzanine level, quickly engulfing several luxury suites and damaging nearby press boxes. Atlanta Stadium hosted a Beatles concert on August 18, 1965 -- before the Braves had ever played there. In addition, the Peach Bowl was held here every year from 1971 to 1991. 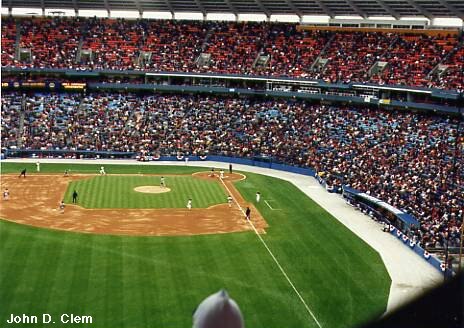 The Braves' schedule was seriously disrupted by the 1996 Centennial Olympic Games in Atlanta, played next door in what was to become Turner Field. As workers began converting Olympic Stadium into a baseball facility that fall, the Braves made it to the World Series once again, as did the Yankees for the first time since 1981. It was a strange affair in which the first five games were won by the visiting team, including the last three games ever played in Atlanta-Fulton County Stadium. (The Yankees won the deciding Game 6 back home in the Bronx.) The former home of the Braves was demolished on August 2, 1997, and a parking lot now occupies that site. The diamond and foul lines are marked in brick, and bronze plaques indicate where the bases once were. In addition, the former outfield fence has been recreated as a monument to the glory days of "Hammerin' Hank" Aaron. There is a monument marked "715" that shows where his record-breaking home run landed, in front of a blue fence marking the perimeter of the old stadium. Click on the camera icon ( ) links below to see each photo.